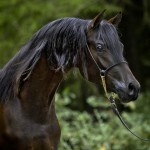 Considered by Janow Podlaski State Stud Director Andrzej Krzysztalowicz to be the best of Comet’s sons, *Dar was credited for producing size, motion, and extreme elegance. The Patterson’s bred *Dar to Marushka to capitalize on the shared strength of their pedigrees, which included exceptional forehand construction, exaggerated length of neck – fine and slender in construction – tying perfectly into a well laid back and powerful shoulder. 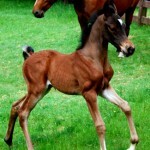 The resulting son, Medalion, is a testament to the genetic strength of his granddam *Mortissa’s sire Trypolis and *Dar’s maternal grandsire Amurath Sahib. Medalion was leased by Tex Kam late in his life to be bred to the magnificent *Gitara whom he earlier purchased from Maplewood Farms. 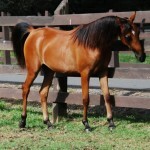 *Gitara adds to the mating her unmistakable presence, dramatic movements and the conformational attributes that resulted in her ability to compete and win as a halter mare at an advanced age. 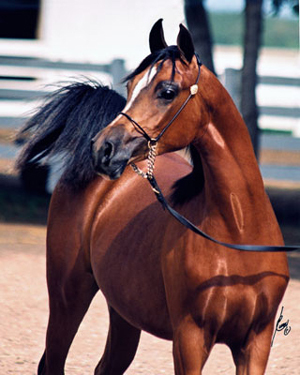 *Gitara can also be credited for producing Gitar MF, who was bred by Maplewood and went on to be named Canadian National Reserve Champion Stallion. Maplewood leased Ginuine for three breeding seasons from Tex Kam specifically for the purpose of breeding her to Erykk MF. From this cross, we produced three individuals with pedigrees drawing from the genetic strength of two of Comet’s most important sons: *Dar and Carycyn. These boys were noted for producing numerous Park Champions including Meridian, and *Era, respectively.